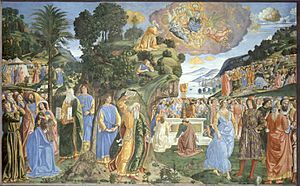 Cosimo Rosselli (1439–1507) was an Italian painter of the Quattrocento, active mainly in his birthplace of Florence, but also Lucca earlier in his career, and from 1480 in the Sistine Chapel in Rome, where he painted some of the large fresco panels on the side walls. 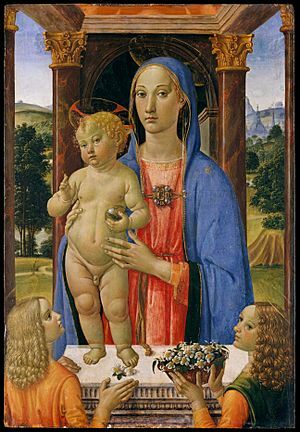 Despite being roughly the same age (slightly older in each case) as Sandro Botticelli, Pietro Perugino and Domenico Ghirlandaio, the other leading Florentine painters, all regarded as greater talents, Rosselli was still able to win several large commissions, which is a testament to the high level of activity in the city. He painted almost entirely religious subjects, with a few portraits. He did other large frescos with his workship, from which Fra Bartolomeo and Piero di Cosimo, who married Roselli's daughter, were his most famous pupils. These include a chapel in Sant'Ambrogio, Florence and one of the large spaces in the cloister of Santissima Annunziata, Florence. Cosimo was born in Florence. In 1460, at the age of fourteen, he became a pupil of Neri di Bicci, working as an assistant to his cousin Bernardo di Stefano Rosselli. Rosselli also spent some time in Lucca, where he painted several altarpieces for various churches. A picture attributed to him, taken from the church of St. Girolamo at Fiesole, is now in the National Gallery of London. In 1480, Rosselli was one of the painters called by Pope Sixtus IV to work at the wall decoration of the Sistine Chapel, together with other masters including; Sandro Botticelli, Pietro Perugino and Domenico Ghirlandaio. The Gemäldegalerie, Berlin has three pictures by Rosselli: The Virgin in Glory, The Entombment of Christ and The Massacre of the Innocents. In 1480 Rosselli, together with the chief painters of Florence, was invited by Pope Sixtus IV to Rome to assist in the painting of the frescoes in the Sistine Chapel. Cosimo Rosselli Facts for Kids. Kiddle Encyclopedia.